The greenest and cheapest mode of transport is as old as mankind itself, but it has been in long-term decline. It is, of course, walking and it’s still a viable mode of transport for many trips. Nearly a quarter of all trips made are one mile or less. That’s a comfortable distance to walk and the benefits are obvious. No greenhouse gases are released, it’s free and there are important health benefits at a time when about 60 per cent of men and 70 per cent of women are not physically active enough to benefit their health. Walking has declined over the years, partly because more people have gained access to cars and partly because walking has become a less attractive alternative on busy, traffic-polluted streets. 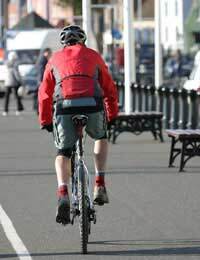 Cycling is every bit as green as walking and has the same health benefits. The cost of buying and running a bicycle is tiny when compared to a car and, as 42 per cent of all trips made are within two miles – cycling is a real alternative. Walking and cycling can provide links to public transport systems and introduce moderate exercise into people’s daily routines. To help avoid traffic, the National Cycle Network has over 10,000 miles of walking and cycle routes on traffic-free paths, quiet lanes and traffic-calmed roads. The well-signed network connects towns and villages, countryside and coast throughout Britain, and 75 per cent of the UK population live within two miles of a route. In big cities like London, a bicycle can be quicker than a car. A bike can travel four miles in around 22 minutes, while it can take a car up to 40 minutes for the same journey on congested city roads. The finances are stacked in the bicycle’s favour too, as no road tax, MOT or fuel is needed, servicing is cheaper and bikes depreciate in value far less than cars. For some journeys it will not be practical to either walk or cycle and in those instances it may be worth considering public transport. Each person in the UK travels an average of 6,500 miles per year, but the vast majority of that distance is in a car, either as a driver or passenger. Only seven per cent of the distance is by bus and six per cent by rail. Leaving the car at home and using public transport is far kinder to the environment. Taking the train instead of the car reduces harmful emissions by a factor of five and using the bus for a similar journey reduces emissions by a factor of 10. Also, traffic congestion could be reduced considerably if more people used public transport, as a bus has the carrying capacity of 10 cars, and a train around 100. For holidays in Europe, it is worth looking at trains and ferries as viable options to flights. When compared to travelling by aircraft, a train will reduce carbon dioxide emissions by a third for trips to, say, the south of France. If going by ferry and car it depends on how many people are travelling. Two people travelling together this way will reduce carbon dioxide emissions by a third, but four people travelling together will cut emissions by about 58 per cent.